100% cotton, high quality patchwork, quilting fabric. Australian ABC rag book. 10 pages including front and back covers. Each page is approximately 25c square. Each letter of the alphabet is depicted by various Australian animals and icons, eg, K for kangaroo, koala, kite, Katherine, Kalgoorlie, key kookaburra. Very colourful little book. 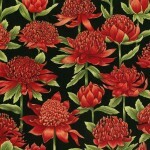 Can also be used as squares on a lovely quilt for a child.